In my posts related with Yogas on which much of misconception is spread, I forgot to include this one. It is called Kem-Drum Yoga. So, how is it made? Whenever Moon is sitting alone in any house and there is no planet in the earlier house to Moon and there is no planet in the later house to Moon, then it is called Kem-Drum Yoga. Like, in the picture attached. Moon is in 5th house in the sign of Libra (7), Moon has no planet sitting with it in 5th house and there are no planets in 4th house or 6th house. So, Moon is all alone in between 3 houses. Moon represents our mind and mind needs some support to balance itself. When Moon is in such type of situation where there is no planet around it, person's mind doesn't get any support to balance itself. It doesn't mean they are crazy people. I can surely say that they are not crazy because I have this yoga in my horoscope tongue emoticon . Now, only thing is that in early part of their lives, they are loner type of person. They don't like to talk too much because they are busy in observing things and people around them. As they grow, this yoga relieves its effect and they start more communicating, but in parties and all, you will still find these people as sitting in side and observing others. Again, if Moon is in earth signs (Taurus, Virgo and Capricorn), then this yoga doesn't give much effect as Moon is finding its balance on earth signs. This yoga can be a very good yoga to become author, because these people observe and imagine a lot. In 7th house, it can make a person good businessman. Remedy :- Most practical remedy for mitigating the impact of this yoga is Blogging. Connect yourself with some cause of your choice and communicate to the world outside. By this way, mind gets connected with some cause and finally finds its balance. @ Nidhi - Moon itself doesnt cause any malefic effect but when it is further impacted by malefics at that time person feels stressed or depressed mind. Sadhe Sati will have its usual impact of challenges. Thanks Sir, for sharing the fact that you have this yoga in your chart... calmed me some how... As I was confused with its result. Being a cancer ascendant, I have moon in my fifth house which is exchanging places with fifth house lord and making maha parivartan yoga. I realised its ill effects rather late.. I have been a outspoken, so never felt that effect, yet ardent reader since childhood ( reading needs alone time so it was always fun time for). It is very near years, I am feeling that I WANT to be alone as well. But, as my sadesati is running for past few years, so do not know how to evaluate this condition. WOUD LOVE TO HEAR FROM YOU. Regards, Nidhi. @ RB - it is formed only when all 3 conditions are fulfilled. all conditions are inclusive. in ur case, it is not forming this yoga. Sir, In your article, you have given three conditions - Moon sitting alone in any house & no planet in 12th house from moon & no planet in 2nd house from Moon. My question is if all three conditions are there then Kem Drum is formed? 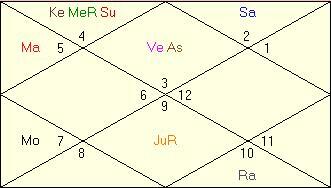 In my horoscope - Kanya lagna, Vrishchik rashi, moon is sitting along 4 other planets - Sun, Jupiter, Venus and mercury. But no planet in Tula and Dhanu. So , is it forming a kem drum? Sir, iam cancer asc, my moon in 11th housetaurus 15° and mercury in taurus 5° no planet in 12th house, sun ketu in 10th house it is kemdrum yog?